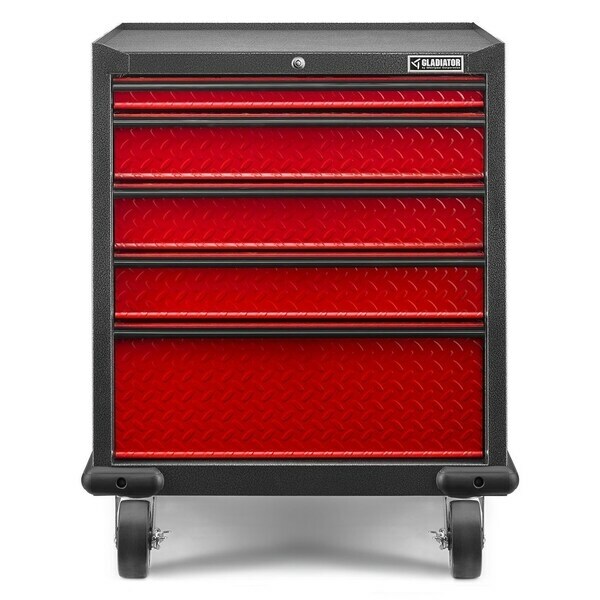 Red tread plate drawers highlight the durability of this five-drawer Modular GearDrawer. Each drawer features solid metal drawer handles, rides on full-extension ball bearing slides for smooth operation and includes cushioned drawer liners for premium style and organization. Steel-welded in the U.S.A., the Modular GearDrawer is backed by a hassle-free, lifetime limited warranty. * Gladiator Premier Modular GearDrawer is also available in Hammered Granite with Silver Tread and Hammered White with Grey Slate. Dimensions 25.0 In. X 28.0 In. X 35.0 In.